Identification: Becker (1983); Page and Burr (1991); Etnier and Starnes (1993). Taxonomy of the genus Carpiodes on the lower Atlantic Slope is uncertain. 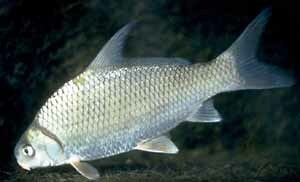 Some of the forms resembling C. cyprinus and C. velifer may represent undescribed species (C. Gilbert, personal communication). Native Range: Lake Michigan drainage and Mississippi River basin from Pennsylvania to Minnesota and southeastern South Dakota, and south to Louisiana; Atlantic Slope in Cape Fear and Santee River drainages, North Carolina; Gulf Slope drainages from Choctawhatchee River, Alabama and Florida, to Pearl River, Mississippi and Louisiana (Page and Burr 1991). Table 1. States with nonindigenous occurrences, the earliest and latest observations in each state, and the tally and names of HUCs with observations†. Names and dates are hyperlinked to their relevant specimen records. The list of references for all nonindigenous occurrences of Carpiodes velifer are found here. Status: Established in North Carolina and South Carolina. Gilbert, C.R. - Florida Museum of Natural History, Gainesville, FL. Menhinick, E.F. 1991. The freshwater fishes of North Carolina. North Carolina Wildlife Resources Commission. Rohde, F. - North Carolina Department of Environment, Health, and Natural Resources, Division of Marine Fisheries, Wilmington, NC. Rhode, F.C., R.G. Arndt, D.G. Lindquist, and J.F. Parnell. 1994. Freshwater fishes of the Carolinas, Virginia, Maryland, and Delaware. University of Carolina Press, Chapel Hill, NC.